Rich Timperio with the artwork he installed. The days of edgy artist collectives and D.I.Y aesthetics are relatively in the past for many big city art scenes. Both the Sun Gallery in Provincetown and the Tenth Street Galleries in lower Manhattan have been replaced by commercial galleries. I was born during the '80s art boom where galleries began to expand and a group of living artists became relatively rich and famous. Today the collective is practically unheard of in mainstream culture. Only a limited few artists are making millions for their work. With galleries and museums often focusing on individuals and not groups the art world is marginalizing many skilled artists. Every now and then a gallery and gallerist come along and makes anything seem possible. 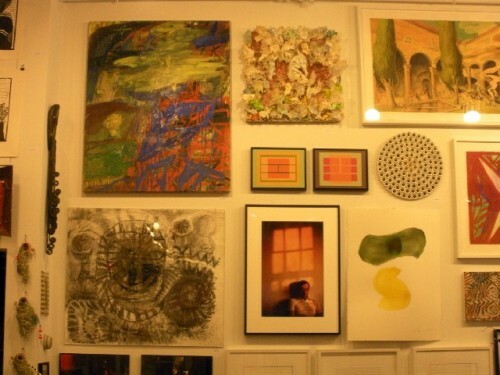 One of these galleries that will make any gallery walk memorable is Sideshow Gallery in Brooklyn, which has been a vital part of the Brooklyn art scene for a decade. "It's a Wonderful Tenth," is more than just an anniversary show, it is a mission statement for not letting the establishment dictate what artists are "worthy" to show. It is multi-media show of hundreds of artists (well over 300), "living and dead, veterans and rookies, warriors and adepts, but all hard hitters with great aim and the lightest touch." The show hung ceiling to floor with sculpture, painting and installation, is a testament to the diverse talent that the art scene truly has. There are artists who any astute art historian or critic would recognize like (but not at all limited to) Paul Resika, Willoughby Sharp, David Kapp, Chris Martin, Larry Poons, Al Loving, Rifka Milder, James Bierderman, Robert C. Morgan, Dan Christensen, and the Second Generation Abstract Expressionist, Michael Goldberg. 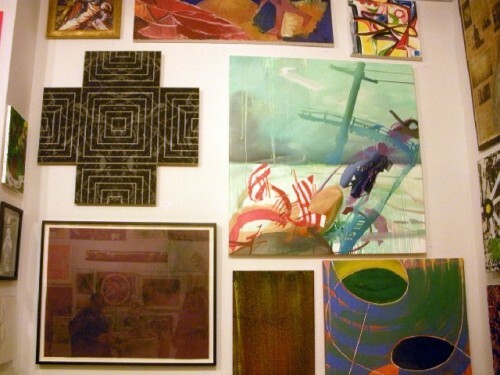 All of these artists and the rest of the eclectic all-star art makers are well represented by works that are indicative of their contributions to the art world. There are also many generations of great artists in this show. This includes husband and wives, siblings, and the sons and daughters of artists. Creativity is genetic but each artist has his or her own strength as an individual. For example, Rifka Milder the daughter of Figurative Expressionist Jay Milder may have inherited some of her luminescent colors from her father, but her vision is uniquely personal to herself. Milder's paintings are fantastic abstractions inspired by the nature of her Manhattan environment. Taking the time to appreciate the subtleties of form and the emotion and energy experienced from her reflections of the world around her. Cecily Kahn, the daughter of painters Wolf Kahn and Emily Mason, and her husband David Kapp are both represented by paintings in the exhibition. Kahn's painting is a vibrant lyrical abstraction. David Kapp's large-scale gestural cityscapes were the focus of a recent solo show at Sideshow although a small canvas in this show represents him. 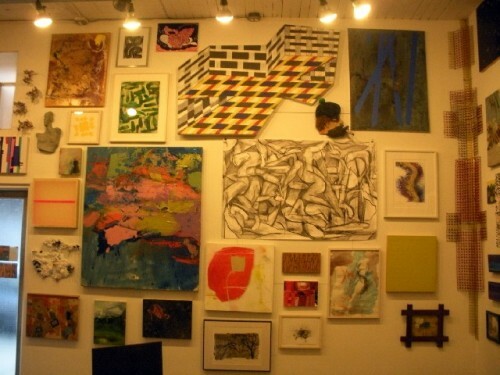 The most amazing part of the show, besides the flawless salon installation, is the depth and range of art. In each medium there is a vast range of talent. Among the paintings there is a hyper realistic painting of an older woman's face by artist Bert Gossen called "Lore." 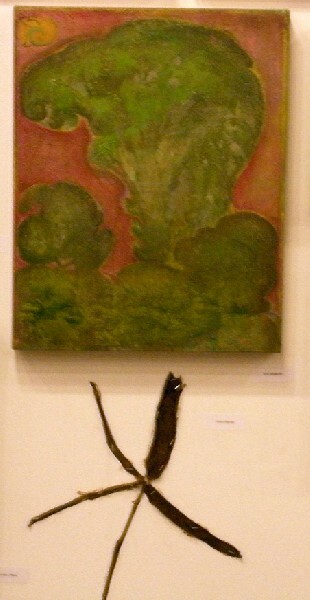 There are gestural abstractions by James Beiderman and Eric Holzman, and there is a comic inspired painting of a cat with a cactus tail by Megan Foster. 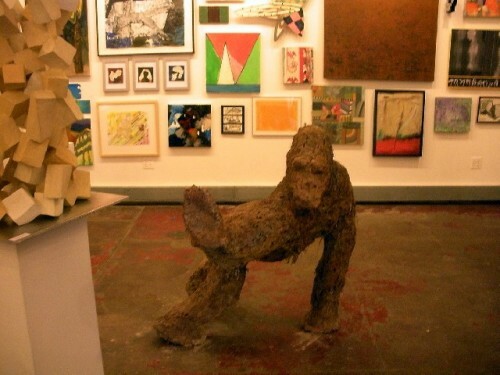 Among the sculptures there is Noa Bornstein's Gorilla sculpture, "Shalom, Salaam, Tomodachi," a hulking brown mixed media sculpture of a Gorilla that looks like he is blocking on the football field. 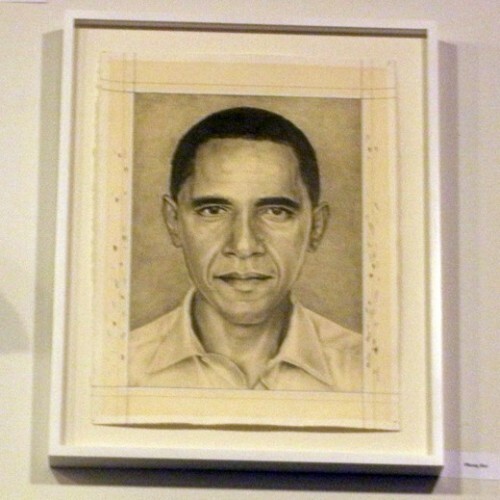 Phong Bui's graphite drawing of Barack Obama is one of the most striking portraits of a president. It was featured in the Brooklyn Rail printed after Obama became the 44th president of the United States. While there are countless kitschy "artworks" profiling (and glorifying) Obama, Phone Bui's drawing is a poignant representation of the artist portraying a very somber mood that is neither glorifying nor derogatory. He presents Obama in a very humanist manner, suggesting that perhaps he is "one of us." 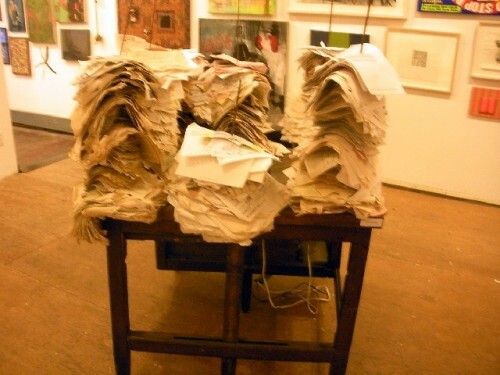 There isn't an overtly political or social message in the show but there is a sense of anxiety in works such as Judy Richardson's installation of audits and bills impaled by sharp stakes. It sits in the midst of the beautiful chaos inside the back gallery. While there is obvious clutter amongst the bills (which seemingly have no specific means of organization based upon structural value), they are organized in some form, kind of like the exhibition if you choose to place symbolic meaning on such a thing. A show of such epic proportions could only be the brainchild of someone who is artistically inclined. Rich Timperio, drag racer, who become art impresario is a visionary for the spiritual nexus of the New York City Art World. His idea for a large group show that would focus on the passionate endeavor of the artist rather than on any fixed approach makes for a collective of art that comes together like a symphony. There is art that screams out loud through massive scale or bold color, juxtaposed with more subtle works. Each one of the paintings in the exhibition feels and looks right where it has been hung. This is something that is rare even in a solo or themed show. Timperio's process of hanging the works was an artistic endeavor all on its own. 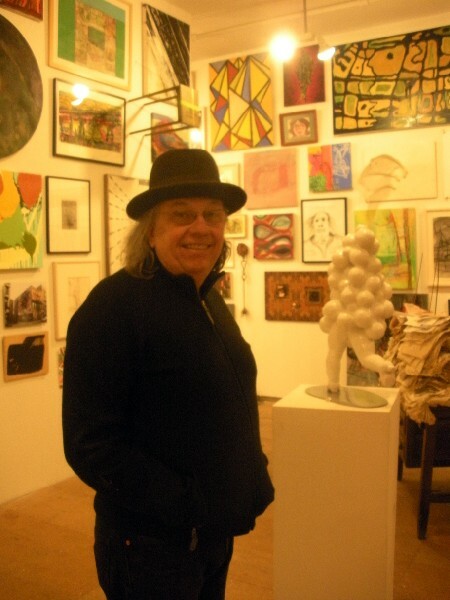 His dedication to advocating good local art by hard working people is best described through a story he told in the gallery. An artist from the neighborhood came into the gallery one day and asked if they could be in the show and Timperio nonchalantly said sure. "This was a beautifully written piece. I am so moved by Adam Zucker's unrstanding of Rifka Milder's beautiful works. 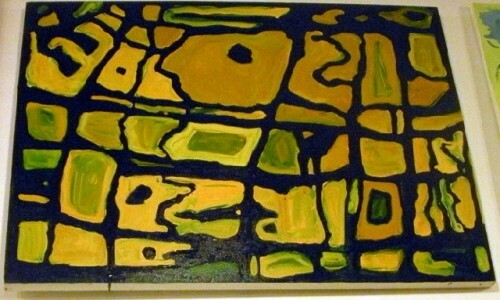 She is truly one of the best abstract landscape artists of her time, and deserves all of the recognition she can get."